NZB Completion Checker now supports an online community check. What this means is, that you can now check your NZB files against an online database. If other users have checked the exact same NZB file within a given time period (up to 5 days), it will display the completion of the files against all reported servers. If you checked your files against Giganews, and another person checks against Astra web, you will see two resuls in an grid, allowing you to select, where you should download the file from. The check only takes a few seconds – a lot quicker than checking the files from you own PC. But whenever the online check fails (eg. no matches are found) – you will have to check the file on your own PC. It will then upload the results for others to use. In the alpha release – this is mandatory! If you don’t like it – don’t use the alpha! It calculates a salted hash from the file, and sends it to the server. The server will then compare the hash against others in the database. 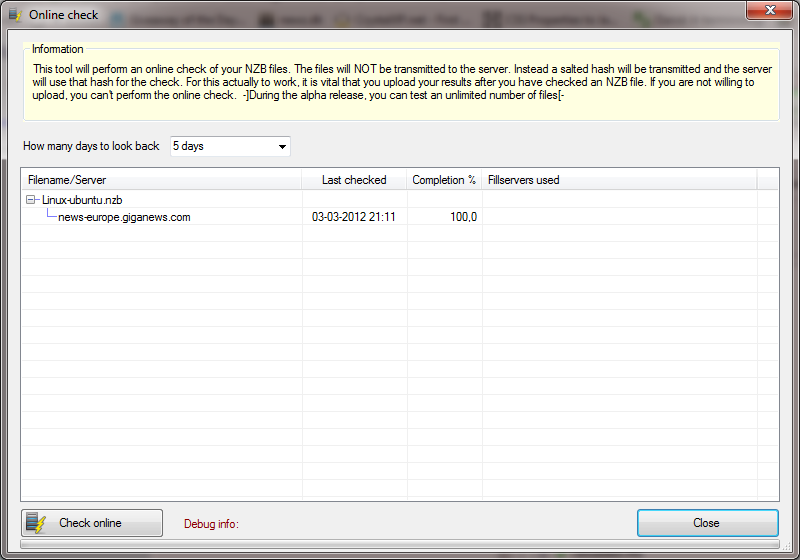 If any results are found, it will be send back to NZB Completion Checker. All of this traffic is going through a HTTPS (SSL) connection. Nothing is logged on the server, except the hash, completion and usenet servers used. Bear in mind, that this is an alpha release – I have only tested it myself, so the database is pretty empty. I hope that a lot of people will test the database with lots of NZB files 🙂 … again, I can’t see what people are testing, it’s only a hash! If you don’t know what a hash is, read about it on Wikipedia. If there is nothing to unfold – the search came out negative. This release also contains a few fixes. It’s now possible to sort/prioritize your servers in the settings form. The top most is used first, and so on. Use the arrow buttons to sort the servers. You still have to select at primary server though! And lastly – a scrollbar was added to the Log tab. This entry was posted on Sunday, March 4th, 2012 at 06:09and is filed under . You can follow any responses to this entry through the RSS 2.0 feed. You can leave a response, or trackback from your own site. Well… that’s the point of the date! You can see when the file was last checked. Anything beyond 5 days is… well.. hard to tell if it’s still there! DMCA takedown notices come more often/quicker now a days. Something must be wrong with your settings. Can your upload a screenshot via the bug form of your server settings? Hello. Thanks for the response. It was totally a user error. I had the server name, which I thought was also the host name. The HostName was empty for me. I put in the host name, and now things are working. Sorry.